In the past, Rock & Roll Hall of Fame used a CRM and marketing tools that didn’t connect or provide the level of customer info/behavior the team wanted to inform campaign performance and resulting decision making. As a result, they found themselves spending countless hours connecting information. The team at Rock & Roll Hall of Fame knew there was a better way, and turned to HubSpot to help. As the team started to ramp-up their marketing, they realized there was a massive opportunity to be a different kind of museum. “As the media, and consumer worlds change, our museum has to adapt and engage people where they are. Today, this means Facebook” Ellie said. Consumers passionate about rock & roll already follow many of their favorite musicians on Facebook, and when it comes time for induction people are passionate to see their favorite band on the list. Before messenger, the Rock Hall marketing team created a lot of resources to share hours of operation, direction, ticket prices, a list of inductees, and more. But today, expectations have changed and fans planning a trip to Cleveland want guidance and expect immediate answers and trusted local recommendations. We have the opportunity to assist with a rockstar experience to Cleveland by being a pseudo-social concierge if the Rock Hall is a driver for a Cleveland trip. The Rock & Roll Hall of Fame leverages HubSpot CRM, and the Marketing Hub to tie all of their activities together and make the customer the center of their universe. 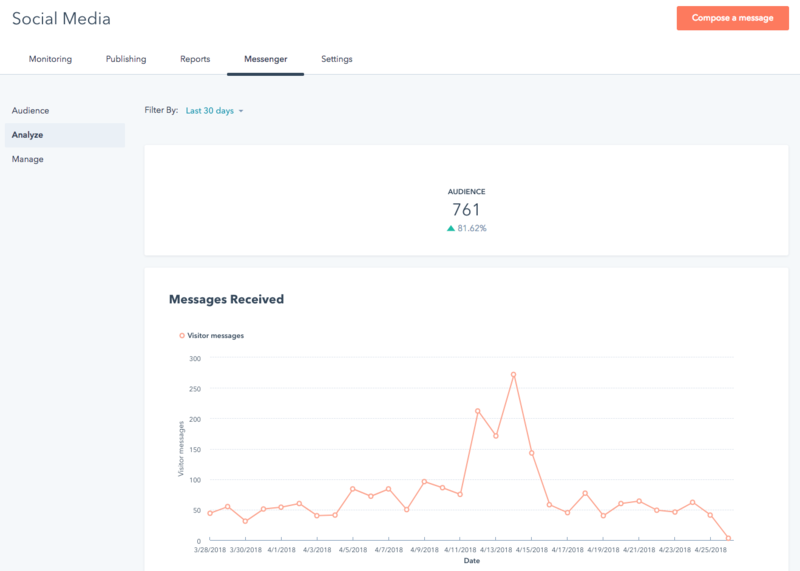 “We now have one central view of our customers and can see email engagement we’ve sent from the recent inductee list, then tie that to messenger chat and ultimately to a ticket purchase,” said Ellie. 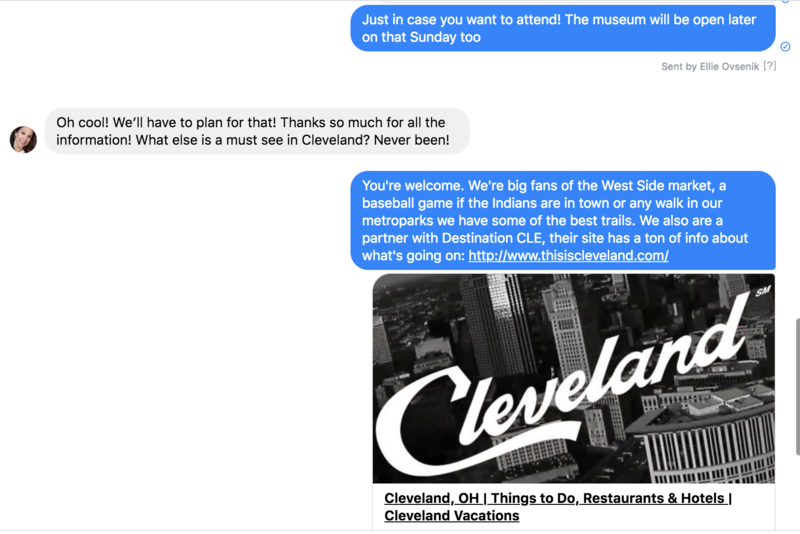 Ellie, and the team at Rock & Roll Hall of Fame use Messenger in their personal lives, so they turned to HubSpot to also use it for their business. The team was in-luck because a brand-new beta solution that integrates Facebook and HubSpot just became available. From the moment Ellie started to use the Messenger integration with HubSpot she instantly changed the Rock & Roll Hall of Fame Facebook page CTA to “Get Started” and within hours, started getting questions from passionate music fans and future visitors. The change was so apparent that on Easter Sunday, the team received 54 messages from 14 unique users most of which were about the museum hours. If not for HubSpot and Messenger, “most of these inquiries would have arrived, and been left, in email or never would have happened in the first-place. Messenger gave these visitors access, and gave us insight into what these visitors want to know” said Ellie. This influx of conversations has made an impact on their business as well. Rock & Roll Hall of Fame found that 12% of people who purchased tickets, messaged them first which naturally helps drive acquisition costs down. People who contact the museum on Messenger also spend 12% more than those who do not. “This is really only the beginning. At this point, 2% of our customers have reached us on Messenger and as we continue to learn this channel we will continue to expand our audience and drive more ticket sales. We’re excited about continuing to communicate with our customers on a channel they already use for personal and business communications, and we’re committed to this integration with HubSpot and Messenger.” Ellie said. 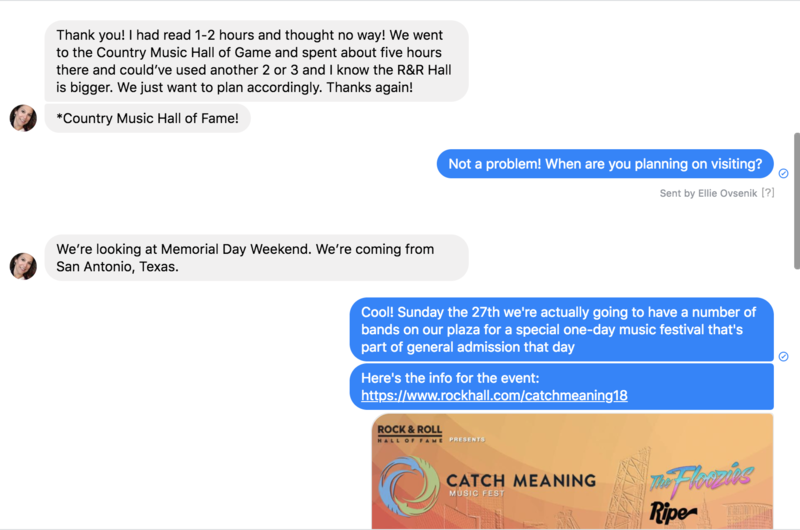 As Rock & Roll Hall of Fame continues to grow, they plan to lean-in further with Messenger and HubSpot and ensure their service, support, and marketing teams are all communicating effectively on this channel, and taking these insights and applying them across their business. The Rock & Roll Hall of Fame leverages both HubSpot CRM and the Marketing Hub, powered by AWS, to tie all of their activities together and make the customer the center of their universe.